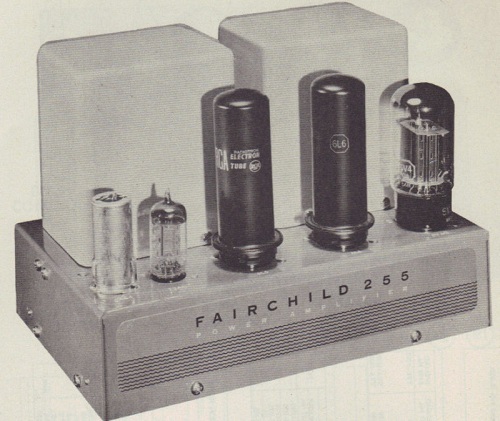 The Fairchild 255 is the ideal power amplifier for the average home or apartment where the higher power rating of the Fairchild 260 50 watt amplifier is not desired. The 255 has been particularly designed for high quality reproduction of music and all other types of program material. Featuring excellent transient response and unusually low distortion at normal and low power operating levels the 255 delivers full power throughout the entire audio frequency spectrum, not only to a resistive load, but also to a speaker load which is, of course, the load presented to it in ordinary use. The 255 incorporates many of the excellent design features used in the 260 such as the exclusive Fairchild distortion-cancelling control which makes it possible to maintain the low distortion performance originally built into the amplifier. Output tubes almost never age equally. In many amplifiers this results in increased distortion requiring replacement of the tubes with matched new ones. With the 255, new performance can be restored in a matter of seconds, and this aural check on performance can be made as often as desired. Measuring only 6" x 9.5", the 255 is extremely compact. There is almost no situation where room for it cannot be found. Construction is simple and rugged and reflects the design purpose of this amplifier which was to provide the best possible power amplifier for high quality home music systems without "gimmicks" which could only add to the cost without adding equally to the enjoyment to be derived from a high quality amplifier. Only by keeping strictly to this philosophy could this truly excellent professional quality amplifier be offered at such low cost. 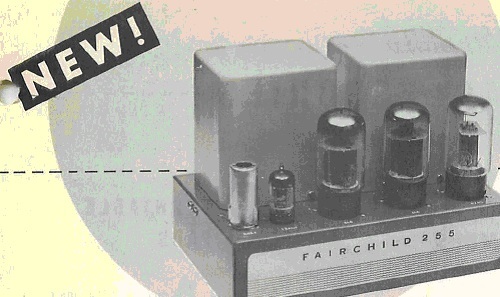 · Exclusive Fairchild Balance Control results in proper balance of output tubes without use of test equipment. · Fixed Bias Supply using selenium rectifier. 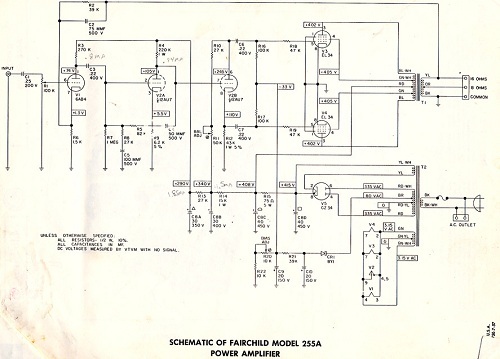 Do you have content, to add, about the Fairchild Model 255 - 25 Watt Power Amplifier or associated topics? Please feel free to Share it, here!